I picked up Kingdom of Ohio last weekend on kind of a whim – the galley had been sitting on my shelf for too long – and it turned out to be the kind of book I just couldn’t put down. It took my four days to finish, but that was only by sheer willpower, forcing myself to look away so as to keep the book from ending. Yes, it was that good. Close on the heels of my review of E.L. Doctorow’s Ragtime, Kingdom of Ohio is another historic novel set in turn-of-the-century New York (despite its misleading name – see below). But unlike Doctorow, whose focus on the impending inventions of the 20th century did so at the expense of the individuality of man, Matthew Flaming’s story focuses on the advent of machinery as a sign of an overarching pattern and rythym of life. Kingdom of Ohio tells the tale of Peter Force, a runaway from Idaho who flees to New York, eventually finding work on the infant subway tunnel projects. When he meets a woman on the street who identifies herself as Cherie-Ann Toledo, heiress to the Kingdom of Ohio, Peter is swept up in a fast-paced adventure of love, machinery, time-travel and the meaning of life itself. The story is narrated by an unidentified man in California, who struggles with the responsibility and ambiguity of accurate recounting. He has dedicated his life to the study of the past, in order to understand the effects of the past on the present, and the place of the present in the formation of the future. He muses on the importance of memory - an ever-unreliable aspect of our minds - and our ability to convey our thoughts in a meaningful way to those around us. These wanderings are punctuated throughout with tales of Peter Force, JP Morgan, Thomas Edison, Nikola Tesla – these are the men that stood on the precipice of invention and changed the way our world functions today. Because of this cast of characters, and the grand questions of time, meaning and consequence, Flaming’s narrative is no small feat. Unlike some time-travel novels, the story is carried across with enough of the gritty details of life in New York – and, for that matter, the Kingdom of Ohio – so as to keep the story grounded in fact (whether this be fact in our world or not, we are left to wonder). Each aspect of the work, be it the narrator’s personal history, the story of Peter Force, the actions of the secondary characters (such as Edison and Tesla) or the explanations of various events (the foundation of the Kingdom of Ohio), is carefully woven in with the surrounding elements, blending together in an almost-perfect harmony of story-telling. Perhaps my biggest complaint about the novel would be the choice of title. 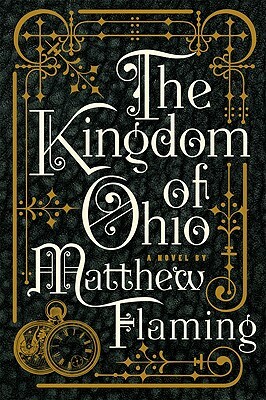 "Kingdom of Ohio" has a certain sense of intrigue about it, of course, and although the novel does focus on the fantastical Kingdom of Ohio (ruled by the Toledo family), I found the title misleading. More than any other place, this was a novel of New York, of a stranger struggling to come to terms with the chaos and machinery of an overwhelming city. But in the grand scheme of complaints, this was a small one. Bottom line: Another work of historical fiction I would not hesitate to suggest. With vague suggestions of the magical realism and New York focus found in Mark Helprin’s A Winter’s Tale, Matthew Flaming has crafted a novel of time-travel within the facts of history, a story of urban and mechanic power within the struggle for order, and a tale of love, passion and identity within the tangled mess of past, present and future. If you don’t mind a bit of suspension of disbelief, and you appreciate the kind of story that weaves over and back into itself, you will certainly enjoy Flaming’s debut. Visit the Kingdom of Ohio website. Disclosure: Thank you to the publisher, Amy Einhorn Books, of Putnam, of Penguin Books, for the galley copy to review. Second disclosure: My apologies to the publisher, Amy Einhorn Books, of Putnam, of Penguin Books, for the delay in reviewing said galley copy. Cool review - thanks! I keep seeing more and more positive reviews of this novel, and I'm intrigued. I also have had A Winter's Tale on my shelf for years - that good, eh? Yes, A Winter's Tale is that good. I had it on my shelf for a few years before I finally picked it up, mostly because I didn't know what I was missing. I'd recommended reading it when it's cold out (the title obviously and appropriately suggests it's a winter read). I'm a bit biased because I tend to really like books that deal with the history of place, especially a place I'm familiar with... but Helprin really is amazing. This is the second great review I've read of this book. I'm really anxious to get hold of it now. I love time travel and that cover is gorgeous, so I'm going to look for this at my library!